Capitalizing on the current AOR melodic rock scene in Sweden, which produced last year's Houston, Sencelled debuts it's first long player. Mostly you have up tempo rock songs with big hooks over strong melodies and vocal arrangement. Early on Sencelled sets the tone, putting these characteristics into motion on the wonderful Breathe Out, the arena ready I Love the Way You Are, and rockers Wild One and Miracle. This last song is likely heaviest piece on the album with some strong riffage. The only ballad comes on Oh Sarah. While the vocals are strong, it's not all that impressive as it lacks soaring hook of, say, Faithfully. The album rounds out with more traditional melodic rock, yet still in the AOR vein. The dilemma, however, is that, while certainly fine, the songs are rather predictable. You pretty much know what you're going to get from Sencelled. That can be a conundrum for any band. But to their credit, the have AOR genre nailed down. The best tracks in the latter half are, perhaps, I Wanted You and Things I Feel thanks to their strong groove, bit heavier sound, and catchy choruses. Carry On attempts AOR positive inspiration, but seems more to point out that aforementioned redundancy. Finally, Tommy & Gina, stealing the characters from Bon Jovi's Livin' On A Prayer, fails to live up to the grandeur of that rock and roll tale. However, again, Sencelled redeems itself with a catchy chorus, even if the song is more than a little cheesy. All in all, however, as said before, Sencelled knows their AOR melodic rock craft, and this will likely be a fan favorite in 2011. Give them a 4 out of 5 simply for the well executed effort in the genre. But where did they get that strange name? 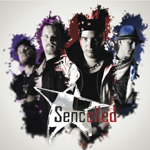 Sencelled delivers solid, entertaining, but sometimes predictable, AOR melodic rock on their debut. Fans of the genre will undoubtedly be pleased with this effort.